Glenn grew up in a family of artists in the suburbs of Philadelphia. He sold his first painting to local collectors in southeastern Pennsylvania when he was only a high school student. Over the last several years, Glenn has participated in many workshops and seminars throughout the country. His work is now in numerous homes and businesses in the eastern and midwestern United States. Inspired by the outdoors, he spends a lot of time hiking, biking, motorcycling, kayaking, and running. His paintings reflect his observations during his travels. He paints with an emphasis on atmosphere and mood. Glenn is a signature member of the Pennsylvania Watercolor Society. 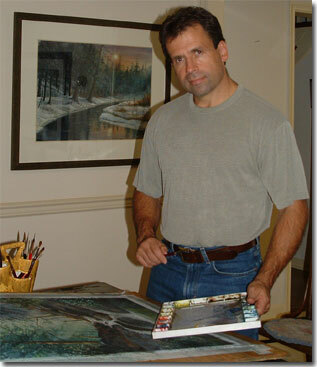 He is also a member of the York Art Association and Lancaster County Art Association.